NileGuide, one-stop travel planning site, has launched an new iPhone app, called What’s Next, geared towards travel recommendations. The startup, which lets you create customized trip itineraries is integrating location-based technology with What’s Next to offer personalized, and interactive content and recommendations in the app, which costs $2.99 on the App Store. What’s Next aggregates content from over 30 different sources, including Citysearch and the NileGuide website, for 200 destinations. The app is designed for travel spontaneity. Travelers can arrive at a destination, turn on their device, touch the “Near Me” button, and find recommendations for nearby activities, restaurants, nightlife, hotels and more. Users can refine these recommendations by filtering with preferences such as “romantic,” “business” or “off the beaten path,” or by searching based on activity type such as museums, spas or golf courses. There is also a filter for hotels and restaurants for “good for business travelers”. Users can also plan trips in advance by touching “Where To” button from the Home screen, choose any destination, and start building an itinerary before they arrive. And the app features much of the guidebook-like content that NileGuide includes on its web site. NileGuide also has a free iPhone app that integrates more of the travel itinerary-creation functionality that is included on the startup’s website. While the travel app industry is a competitive space, this new app from NileGuide could be an incredibly useful tool for on-the-go recommendations with a location-based twists. And its reasonably priced given the vast amount of information included in the app. 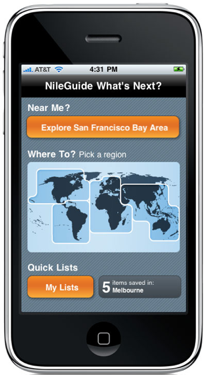 Founded in 2006 and based in San Francisco, NileGuide has received $9.5 million in funding from investors including Draper Richards, KPG Ventures, Austin Ventures, and Tenaya Capital.